Hello! My name is Verchiel and I’m from Joleene Naylor’s Amaranthine series. I am filling in for Katelina because…well, I’ll get into that in a moment. But, using state of the art-mumbo-jumbo-author magic, Jo has had Katelina interview other authors’ characters. Now she is interviewing our fellow Amaranthian’s. Even better, the questions come from you, the readers! So let’s get this party started! As I said, this is Verchiel, filling in for Katelina. You see, today’s interviewee is Claudius, who some of you might remember has devoted time to… well, let’s just say he’s been out to get her. Because of their, erm, past, she refused to interview him, so I stepped up – again! Aren’t they lucky to have me? Claudius: Oh, it’s you. Wonderful. C: Can we get on with this? V: Oh, all right. Despite the fact that most of the readers hate you, there were a few questions for you. V: Hey, hey, let’s not insult the readers, huh? I happen to be quite fond of them! C: I wasn’t insulting them. I was merely stating that they haven’t been permitted to see the other side of it. Let me kidnap their mate and see how they feel about it then. C: And who’s made that determination? Who has the right to decide what is love and what is not or who loves and who does not? V: You know, if you’d just SAY it, it would go a long way towards convincing people. C: I don’t need to “convince” anyone! What I feel or do not feel is of no consequence to anyone but myself! *narrows eyes* Why are you here again? C: Oh. Her. Jorick’s annoying human. Or Patrick’s. Or whoever she belonged to. It gives me a headache trying to decipher it. If given the choice between the two of you, then I must say you’re the better option, though only just. Ask the questions and get on with it. C: An interesting question. One is not so much an advance, but a shift in social attitude. I find it intriguing that in the New World bloodlines don’t carry the value they did, or even still do, in the more civilized world. That paternity, or even maternity, no longer matters is an interesting concept with both pros and cons. As far as advances, such as technology, I find most of it too noisy and distracting. There are televisions, cellphones, radios. Every moment is bombarded with noise and the pouring out of someone else’s ideas, thoughts or feelings. It’s no wonder that the modern world is stilted and unoriginal. One can not have an original idea because their mind is too overrun with everyone else’s ideas. C: Ah. Yes. Francoise. You are correct that I “removed” her when it proved necessary to do so. She was… how shall I say it? She was common, yes, but she was also condescending and she had all the qualities of a large anchor, weighing me down and holding me back from achieving any kind of lasting greatness. Not only by her ridiculous rules, but also because she was determined to remind me on a nearly nightly basis of exactly where I had come from. Eventually the time came when she needed to be reminded where SHE came from. The fact that she shared immortality with me only stretched so far. Should a child shower praise and devotion on an unworthy parent? C: You deal with it your way, and I shall deal with it mine. Next. C: What was dumb was not killing her. Had I known that Jorick was really as attached to her as he is, I would have done so. Not that it would have equaled what he did to me. Perhaps you’ve forgotten what he did to my mate – who had been with me for centuries? Though because I’m not the main character the death of MY companion doesn’t matter, is that it? V: Um, actually, we can’t get into too much of this or we’ll spoil the plot. C: For whom? Hasn’t everyone who’s ever going to read those dreadful books already done so? I can’t really imagine that a hack author like this could continue to draw new fans. V: Weirdly enough, it does happen. Wait, I don’t mean it’s weird. Our author is great. So great, in fact, that she should quit doing book covers and start writing full time. I’m seeing a “Verchiel” spin-off series. C: Please. What would that entail? “Verchiel breezed in, made a few comments that failed to be amusing and then breezed out again, all the while doing nothing of any importance.” There. I’ve completed the series for you. You and our hack author are both welcome. V: That wasn’t very nice. We’re running out of time, but I have a final question before you go. Though you’re not in the newest book, Ashes of Deceit (to be released May 2012), some former members of your coven are. How do you feel about their new affiliations? C: Which ones? That Hectia refused to submit is cheering to a point, but that Kale and Joseff… Well, there are laws, aren’t there? If one puts aside their personal feelings, they can acknowledge that Kale was forced to follow the laws and his newest alliance, while it is enough to make my blood boil, is advantageous for him. One must always choose the most advantageous path and not allow sentimentality to cloud one’s judgment, so in that respect he has done well. V: And with that we’re out of time! The next interview is Oren (and Katelina will finally return to interviewing!) so leave your questions for him on this blog and as always thanks for stopping by! LOL thanks! Verchiel enjoys doing these more than Katelina does, I think. LOL! wow loved his answer to my question. Excellent. Maybe he’s not such a bad guy as you paint him to be, eh Jo? Ha ha! 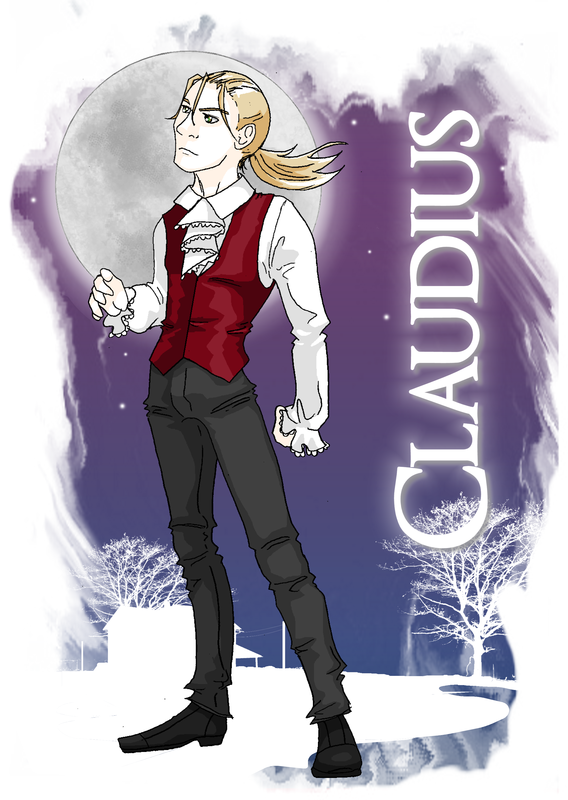 Yeah, Claudius is an interesting character to say the least. His main trouble is he is so self absorbed. Someday I’d like to see him and arowenia actually together for a story. I think it would be interesting. I loved this interview. Great job on this. Well, and yes, I’d believe Jorick and Oren over Claudius any day. Ty! Yeah. Claudius has this tendency to be melodramatic, LOL!